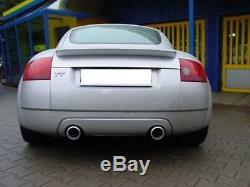 Ulter sport exhaust stainless steel audi TT 8n cabriolet coupe 98-06. This product page has been automatically translated. If you have any questions, do not hesitate to contact us. Product Page zinit solutions gmbh. Work hours from Monday to Friday 08:00 18:00. 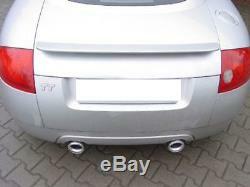 Ulter stainless steel sport exhaust system audi tt 8n convertible cup 98-06 1.8 t re li I 1x100mm. If you have any questions about our products, processing etc. Contact us by email or phone. Ulter sport muffler stainless steel outlet: right / left pipe end kit: re / li 1 x 100 mm suitable for: convertible type audi tt 8n bj. 98-06 / coupe quattro 1.8 l turbo (132kw + 165 kw) notes: - stainless steel exhaust outlets of high quality -silencious stainless steel. Manufacturer Information - ulter-sport exhaust. Founded in 1986, as a small service, ulter began 1990's silent to produce and sell. After you had initially limited to standard silencers, ulter began in 1992 with the production of sport exhaust systems and locomotive. Seitdem is dedicated to developing and introducing new technologies and high quality materials. The muffler claims this and above average satisfaction that it has been awarded a "pimot" certificate in warsaw and now "b" must label its products with the security label. In 2001 the company was renamed ulter-sport ltd. And began with the construction of a modern factory, which could meet the high standards of Western Europe. The new production plant of wegierska górka outside zywiec, inaugurated in 2003. 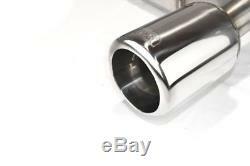 It produces ulter still high-quality sport exhaust and thus conquered the hearts of many tuning fans in all of Europe. In 2004, the factory was certified according to ISO 9001: 2001 by Tuv cert Sarre. Now the ulter-sport products in poland, slovakia, ukraine, hungary, lithuania, czech republic, russia, germany, denmark, netherlands, belgium and even in far-away turkey have established themselves, which has confirmed the ever increasing quality of products. List of driving vehicle applications. This article can be used inter alia for the following vehicles. 10.98 - 06.06. 07.03 - 06.06. 09.05 - 06.06. 03.05 - 06.06. 02.00 - 06.06. 10.99 - 06.06. Upon receipt of the total amount, your merchandise is ready as soon as possible. Take advantage of our favorable delivery conditions and pay your order upon receipt of the goods directly from the delivery service. Please note that additional charges apply for this service. This number is only for deliveries in Germany + if necessary possible from Austria. On purchase on invoice, you take no risk. This number is available for customers from Germany. Is the bill for a lump sum too high? Our santander partner bank offers favorable conditions. To determine the maturity and the height of the tariffs. This number is only available for customers residing in Germany. Important - they ask us to do it before buying! Please help us keep our prices low, leaving us a 5 star rating. Neutral or negative feedback does not solve the problem! We thank you for your support! 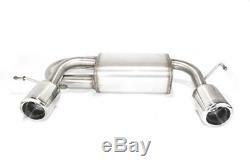 The item "sport exhaust stainless steel audi tt 8n convertible coupe 98-06" is on sale since Monday, September 10, 2018. 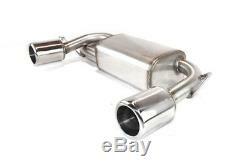 It is in the category "auto, motorcycle parts, accessories \ tuning, styling \ exhausts \ silencer" The seller is "www_sportauspuff-direkt_com" and is located at 09130. This item can be delivered anywhere in the world.